The Spanish Rafeal Nadal beats the Swiss maestro Roger Federer in straight sets in an exhibition event final held in Abu Dhabi, United Arab Emirates. This starts Rafa with 2011 on a high note, this also becoming some kind of redemption after losing to Federer in O2 , last year. This was also the fourth time in five weeks these two tennis giants had come tete-a-tete, following ATP World Tour Finals in London , and two charity matches held last December. On the other hand Robin Soderling beat Berdych 6-4, 7-6(7-3) to secure third place. 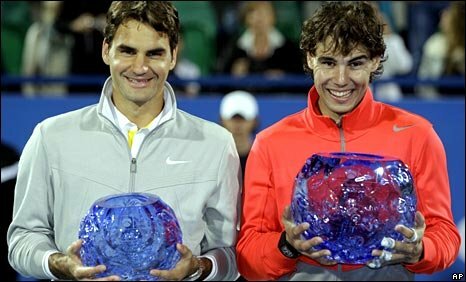 "Rafael and myself must have played so many times and so many times it has come down to a few shots here and there. He is an amazing shot-maker. Me as well but today he got the better of me." "I never lost my serve but I still lost the tournament, it's kind of tough," said Federer. "For both of us, these are the first matches of the season. So it is special for us. This is the perfect place to start the season here in Abu Dhabi."